Is the US about to attack Syria? President Obama has approved air surveillance of Syria to monitor possible ISIS activity, but the flyovers could be a precursor to eventual airstrikes. Here we go again. Into a new theater of the never-ending terror wars. And into the midst of another civil war. U2 spy planes and unmanned drones are -- presumably -- already in the air, causing the Assad regime to warn the US against any aggressive actions, lest we "Make a mistake" -- miss an ISIS target and, say, bomb his private residence or defense HQ instead. By accident. We sure love our drone strikes. And they do have a tendency to miss on occasion. Accidentally, of course. 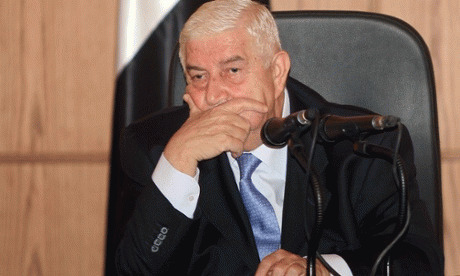 "Walid al-Moallem, the Syrian foreign minister, said his government was ready 'to co-operate and co-ordinate' with any side, including the US, or join any regional or international alliance against Isis. But he said any military action inside Syria should be co-ordinated with the Syrian government. 'Any strike which is not co-ordinated with the government will be considered as aggression,' he said. "Moallem appeared acutely aware of how much has changed since last August when the US was threatening to carry out punitive air strikes against Assad's government in the wake of a chemical attack that Washington blamed on his forces. Since then global disapproval has shifted away from Assad and towards the Islamic extremists who are fighting him and spreading destruction across Syria and Iraq Moallem said Damascus had warned repeatedly of the threat of terrorism and the need to cut off resources and funding but 'no one listened to us.' Syria's government has long described the rebels fighting to topple Assad as 'terrorists' in a foreign conspiracy. "President Barack Obama has been wary of getting dragged into the Syrian civil war, which the United Nations says has killed more than 190,000 people. He has resisted intervening militarily in the conflict, even after the deadly chemical weapons attack a year ago that Washington blamed on President Bashar Assad's government. "But the extremist group's rampage across wide swaths of Iraq, declaration of a state governed by their harsh interpretation of Islamic law in territory spanning the Iraq-Syria border, and beheading of Foley have injected a new dynamic into those calculations. Now Obama faces pressure from his own military leaders to go after the extremists inside Syria. "On Monday a senior administration official said Obama authorised surveillance flights over Syria, a move that could pave the way for US air strikes. The official was not authorised to discuss Obama's decision publicly by name and insisted on anonymity." Anybody want to guess what Russia's reaction to all this will be? Putin is in the midst of his own civil war in Ukraine. He and Assad are buddies, and probably won't be too happy with the US if we carry out airstrikes without the green-light from Damascus. A year ago Putin warned that if the US engaged in an attempt to overthrow Assad over his alleged use of chemical weapons against his own people, that Islamic extremists would rush in to fill the void. What a difference a year makes. Now the Obama administration is contemplating airstrikes in Syria against a group that is threatening the Assad regime, because of its territorial gains in Iraq. The end result being support of Assad. The irony is stunning. But so typical of our convoluted relations in the world. Looking at a regional map it's hard to find a spot where the US is not involved in some nasty business. With the chaos in Russia and our growing hostilities with Putin, can an all-out World War Three be on the horizon?